"Prevention is better than curie." What's up, Duck? The word quack comes from the Dutch word quacksalver, which translates literally as chatter salve; someone who skites about the effectiveness of their cures. 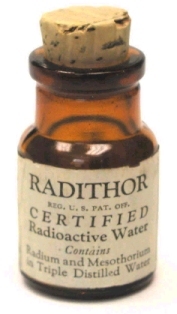 Such quacky bombast accompanied the introduction of Radithor, a medicinal version of Radium much favoured as a miracle cure-all in the early part of the 20th century. It was said to cure cancer, baldness, impotence, eczema, constipation, you name it. William Bailey, Radithor's inventor, employed no degree of sarcasm (initially, anyway) when he promoted his wonder elixir as "a cure for the living dead". Naturally, as is the way of these things, disturbing reports started to surface. Possibly the most well known was the watchmaker ladies who would straighten brush tips on their lips as they applied luminous, but radium filled, paint to watch faces. In the mid-twenties these gals began reporting symptoms such as bone decay, jaw abscesses and their teeth were falling out. The upside, though, was luminous snot. Quite the party trick, apparently. "Turn the lights orf, someone. Dotty's going to blow a shiny wad! Huzzah!" Then there was rakish millionaire Eben Byers who between 1927 and 1930, drank 1,400 bottles of Radithor; ostensibly because he had a sore arm. He died in 1932 not long after his jaw fell off and he had spent his last months sucking apple-sauce through straws. Thus Radithor went the way of other great medical breakthrou ... downs. Phrenology used the shape of your head to supposedly determined your character; you know, whether or not you'd be able to grasp the difference between calculus and a spoon. Radionics claimed that radio waves could diagnose any disease from a single drop of blood. And Metallic Tractors - no, not what Pop Larkin jumps on when it's time to get the cider in - was a process whereby people were hooked up to electricity and given shocks to cure asthma, cataracts, mumps, cancer and ... well, pretty much everything. As it happens, I'm an expert in electrickery, so if you want to give metallic traction a whirl, pop around here and I'll hook you up to my car battery. For a fee. There is a school of thought, though, that suggests the application of small doses fo radium isn't entirely bogus. A 30-year follow-up of 1,155 low-dose radium dial painters showing that they had significantly fewer cancers than the general population and also lived much longer. Most people are also unaware of long-term studies showing that Hiroshima and Nagasaki survivors with a low exposure to nuclear radiation are now healthier and living longer than controls who resided in unaffected Japanese cities. About a million patients are treated annually with low-dose radiation at Russian hospitals and this is now also officially endorsed in Japan, presumably because it is cost effective as well as safe. Radiation hormesis may have a tough road to hoe in the United States, but it has strong and growing scientific support. Incidentally, Marie Curie was the one who discovered Radium. When she died of leukaemia in 1934, she had great chunks of several fingers missing. Radiation therapy is used in cancer treatment in France as well. Or have I just completely misunderstood your text. I wonder, Anne, me not being a medical type and all, whether radiation treatment for cancer is different from the radiation effects of Radium and Radithon. As the later bit suggests, maybe it's a matter of degrees. We have radiation cancer therapy here, too. Were any of Marie Curies' fingers preserved for later inclusion in a Wendy's burger? I bet there's been the odd finger served up in a burger. Other body parts, too. Not sure if the fingers belonged to Marie, though. In fact, I'd win the bet. Nothing to do with radiation, but I attended a sports medicine seminar once. They had a chappie give us a lecture on the history of sports medicine. At one stage, apparently the cure for repeated cramping in the same muscle was to kill a cat by slitting it open lengthwise and then wrap the cat around the offending muscle. You know, I'm trying very hard to think WHY anyone would think wrapping a dead cat round your leg would halp cramp. Sounds like a good plan to me, Dirk - I can think of a few cats that would be prime candidates. Tony, there's a good history of this sort of thing in Australia recently published, "Paradise of Quacks". Plus it was written by a rellie, and I'm getting a percentage. It actually sound like a good read, Waste. Paradise of Quacks is both a sparkling, witty book and a full-length scholarly history of medicine in Australia. It is a history of scientific medicine that looks at the field’s disreputable origins in the convict colony and its struggle for respectability. It is also a history of alternative medicine that covers the growth of popular non-scientific therapies. Sounds the business. Another I'll put on my listy. Half-life etc would make an excellent tee shirt. Should piss a few greenies off too! Which as you know, is always good for a laugh. Peter Garrett should get one for when he fully converts to nuclear power. Dirk - I often get cramps in bed at night. Any suggestions? Do I need to keep cat warm? I suppose it does need to be a bit warm to "wrap around". Which way should I wrap it - lengthways or sideways - fur side in or out?